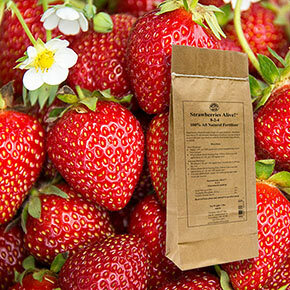 Home » Tools and Décor » Fertilizers » Strawberries Alive!™ 1lb. There's good reason to make the most of your Spring Hill Nurseries strawberry plant. From the ornamental beauty of little ruby-hued fruits suspended over the edge of your favorite patio table pot, to that delectable sun-ripened flavor you can't get enough of, it is truly pleasure to grow. We teamed up with Gardens Alive!, the big name in all-natural fertilizers, to offer a specially formulated slow-release strawberry fertilizer that'll encourage stronger plants, vigorous growth and loads of sweeter berries. 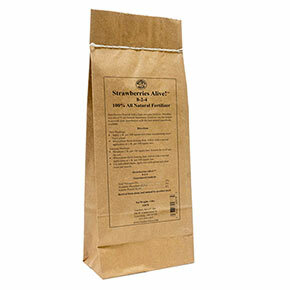 Its all-natural ingredients promote healthier soil, full of micro-organisms that'll provide your plants more nutrients and water. Covers 100 sq. ft.